Situated in Central Italy, in Southern Tuscany, the lagoon of Orbetello is a unique ecosystem connected to the sea. It covers an area of 27 square kilometres and is both a reproduction site for several fish and an economic resource for the local population. This large, mirror-like body of water was once regulated entirely by nature, but is now subject to human pressures making its management increasingly complex. The lagoon has been in use since Etruscan and Roman time periods and regulation of its fishing practices has taken place at least since 1414, when the lagoon was under the control of the Siena Republic. Fish processing also has a historic tradition here. Different from classic smoking and marinating methods, two unusual processing techniques are a legacy of the Spanish rule of the 16th and 17th centuries. These methods are called sfumatura, whereby fish are seasoned with a sweet pepper-based sauce, and scavecciatura, which is a kind of escabeche that uses a hot marinade of vinegar, rosemary, garlic and peppers. Traditional fishing techniques employing the lavoriero, martavello and the tramaglio are still used to catch a variety of fish. Sea bass, sea bream, grey mullet, eels, small clams, small fish called calcinelli, mazzancolle (a type of shrimp) and a small kind of crab called femminelle are the most commonly caught species. Over time, these techniques have been modernized, but they have maintained their sustainability. The fish come into the nets on their own, based on the season and the tides. 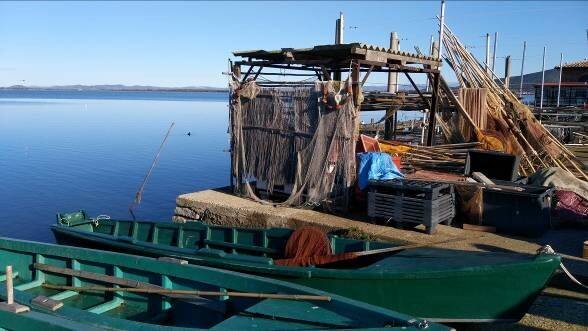 Orbetello fishermen today have recuperated ancient traditions mixing in some modern fish farming techniques that remain sustainable for the lagoon. Unfortunately, the fishermen’s sustainable activities are made increasingly difficult by regular disasters caused by external factors, such as overfishing in the open sea, that have reduced the stock coming into the lagoon. In the 1980s and 1990s the local community almost disappeared. They have now managed to form a cooperative to join forces and have recovered. Thanks to their long culinary traditions, fishermen have been able to sell their sea products to supermarkets and shops as well as use them for local dishes served in local restaurants. This unique system has been made a Presidium by Slow Food. Slow Food Presidia sustains quality production at risk of extinction by protecting unique regions and ecosystems, recovering traditional processing methods and safeguarding native breeds and local plant varieties. Situated in Central Italy, in Southern Tuscany, the lagoon of Orbetello is a unique ecosystem connected to the sea. It covers an area of 27 square kilometres and is both a reproduction site for several fish and a direct economic resource for more than 100 families of the total local population of 14,000 (Figure 1). This immense, mirror-like body of water was once regulated entirely by nature, but is now subject to human pressures making its management increasingly complex. Although Orbetello is not the only case of lagoon fishing in Italy, it certainly is one with a long history of documentation and management. There is extensive documentation (Damiani 2013) on the struggle to balance the economic exploitation of the lagoon (gaining fishing rights) and the maintenance of a healthy ecosystem. Management or mismanagement of the territory surrounding the lagoon (for example through deforestation) has wielded effects on the marine ecosystem. Surprising facts were discovered regarding the negative effects of deforestation on the marine ecosystem (Pantaloni 2014). The Orbetello fishermen learned that cutting trees reduced the fish stock in the eighteen hundreds. An important issue that the documentation revealed was the debate surrounding who should manage the delicate marine ecosystem that represented at the same time both the livelihoods of an entire era, as well as a nature reserve. Despite making some mistakes, such as a lack of consistency in the maintenance of canals, the documentation suggests that the local people, given the power, mostly took steps in the right direction. Mismanagement, such as renting out the lagoon to the highest bidder that just wanted to use it to make fast cash, on the other hand, occurred when higher ranking politicians got involved, mostly motivated by the search for funds from fishing rights to be used elsewhere, such as for various city expenses. The Orbetello story is a mixture of gastronomy, intercultural exchanges, land and sea management, and passion, which has secured the sustainable livelihoods of a small group of fishermen (about a 100) so far. The need for regulating fishing practices in the lagoon arose probably during Etruscan and Roman times. The first copy of the rules (Statuti 1797) is from 1414, when Orbetello was controlled by the Republic of Siena. At the time, Italy was divided into a number of different independent states and partially controlled by foreign powers. The 1414 fishing rules are detailed and concern regulations about where to fish, as well as outline forbidden fishing areas, reserved fishing areas, bans on large animals near fisheries and the size of fish and fish prices (Damiani 2013, p. 11). The setup of 1414 shows that the two fisheries of Nassa and Fibbia were managed by the local council, either directly or rented to a third party. Notes reveal that fish prices were regulated, the location where fish were to be sold in the village was also determined, and that the price of fish would increase during Lent because Christians could not eat any meat due to religious requirements. Other notes from 1489 and 1540 (Damiani 2013) show that to preserve the stock, some fishing methods were forbidden and a ban was imposed that prohibited the catching of fish weighing less than half a pound. Already at that time the need to maintain the stock was felt, as was the need to restrict the number of people fishing in different areas. The best areas for fishing, where the lagoon exchanges with the sea via tidal waves, was the most regulated and managed (recurring rules in Damiani 2013). In the long history from 1400 to 1900, the Orbetello City Council distributed fishing rights in the best part of the lagoon to the party that could pay the highest fee, mostly established via a public auction. This system, when fully functioning, effectively divided the community into two parties, the renters that had the best fishing area and the other party that was excluded. The excluded, i.e. the rest of the fishermen, called themselves “free fishermen” or “noble fishermen” in opposition to the renters. While establishing fishing rights in the best area certainly reduced the amount of fishing, it also threatened the livelihoods of others. The Orbetello free fishermen’s area was limited to the eastern part of the lagoon that contained less fish and was a fraction of the western one. Damiani (2013) remarks that most free fishermen had very limited revenue and their survival was put at stake when they were excluded from the best areas. The free fishermen suffered fines, their boats were seized and they were even put into prison when they were caught fishing in the forbidden areas. Instead of these penalties causing a decrease in the amount of trespassing into the forbidden fishing areas, the penalties only increased over time, making it evident that the fishermen could not survive if denied access to the best part of the lagoon. In 1789, the Orbetello City Council even used revenues from fishing rights as collateral for receiving some funds to restructure their hospital. It is evident from the city archives that this rental model was clearly useful for the local council cash flow but was grounds for a deep revenue inequality within the local fishing community. Orbetello (and the small surrounding areas) remained for about two and a half centuries (between 1557 and 1801) under the “State of the Presidi” or the “State of the Garrisons”, a possession of the Crown of Spain, administered via the Viceroy in Naples, after it went to France and Tuscany. Meanwhile it went through sieges and wars that we will not investigate here except for their role in exposing Orbetello to Spanish culture and especially to new fish preservation techniques that had not yet been introduced to local production. Most notably, it introduced the bottarga from Orbetello consisting of salted, cured fish roe, of the local variety of grey mullet. Another fish preservation technique they were exposed to was scaveccio, fish marinated in onion and vinegar, also unknown at the time to the local population but very popular in the rest of the Spanish territories. Ceviche is a similar interpretation of fish preparation with acidic condiments but with a very different evolution in South America. The Orbetello records (Statuti 1797) show that the lagoon has been a pretty stable ecosystem until the last century. The lagoon froze in 1603, 1709 and 1755 with no negative consequences on fishing and once in 1788, leading to fish scarcity for a few years. There is also a record of one flood in 1758. Certainly a more worrisome natural event occurred when the water became murky and started giving off a bad smell. This event was recorded in the years 1722 to 1725. Deforestation also had a negative effect on the lagoon. Complete deforestation occurred when the northern dunes, the area of Feniglia, which was entirely covered with woods, was sold to new owners in 1804 who used the area for logging and cleared it for pastures (Pantaloni 2014). The northern dunes are a strip of sand and pebbles composed mostly of detritus from the nearby river Albegna. The dunes separate the lagoon from the sea on the north side. Once these areas were bare due to deforestation, erosion increased, causing sand and dirt to fall into the lagoon. The wind and rain also led some areas of the lagoon to dry up and suffocate or form swamps and wetlands, increasing malaria and reducing fish habitats and water cleanliness. In 1610, the famous painter Caravaggio, died here of malaria. In 1842, road construction caused further problems to the lagoon’s water movement. A road was built on a dam in the middle of the lagoon, cutting the water body in two and reducing the natural exchange of water. Furthermore, another road inland along the coast further reduced the flow of river water into the lagoon. The roads were surely important for local transportation but did not take into account the lagoon’s water circulation needs. Management evolved in modern times and led to the creation of a cooperative. A particular incident caused a change in the type of lagoon management. In 1899, the Orbetello City Council was unable to find a renter for the western part of the lagoon due to the deteriorated conditions of the water. Fish were less abundant, the canals were full of mud and sand, and it was difficult for fish from the sea to access the lagoon (Damiani 2013, p. 58). At the same time, new political parties had changed the council as well. The council voted to manage the fishing rights themselves, giving assignments to different fishermen chosen randomly from the town. The chosen fishermen would then have to pay for the fishing rights by giving the council one-third of the catch every day. A set of rules was designed ad hoc for this. Meanwhile the council would start fixing the lagoon problems. The provincial powers did not seem to agree with this new system, but allowed it to continue (Damiani 213, p. 62). This represents a change of model that lasts until 1907, when the western lagoon is once again rented out until 1945, when it switches back into the hands of the council again. In 1946, 13 “free” fishermen founded a cooperative to manage fishing in the lagoon, and in 1960, the cooperative absorbed some other fishing companies. It remained the only one in 1989, with the City Council as partner. It took the name of Orbetello Pesca Lagunare Spa (OPL). From 1993, the council left as a partner and the cooperative became an entity of its own, owned solely by fishermen. Its structure is composed of two different entities: the Orbetello Pesca Lagunare (see Figure 2), that sells the fish and products, and the La Peschereccia, the traditional cooperative that owns the fishing rights and manages the restaurant. In exchange for guaranteed fishing rights until 2019, the cooperative pays the City Council a fixed cost plus ten percent of fish sales. It is also required to provide the residents of Orbetello with a certain amount of fish at a controlled price. The cooperative is a particular type of company in which owners can only be individual people and by which there cannot be any profit apart from the well-being of the partners. Each partner (in this case, each fisherman) has only one vote and every partner’s vote counts the same. The cooperative’s main aim is to maintain the jobs of the partners. Because the cooperative is an inclusive entity, it absorbed most if not all the free fishermen, therefore redistributing fishing rights to all “free” fisherman in an equal way. It has the advantage of giving the same salary to all, but its structure is less flexible than that of a regular commercial company, so changes take time to be implemented. Shortly after the inauguration of the road, there was an increased awareness manifested by the City Council on the issues of lagoon health and hygiene. 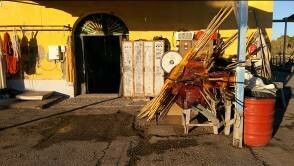 For example, fishermen left their tools made of wood, ropes and reeds in the water, with the result that they would eventually rot. 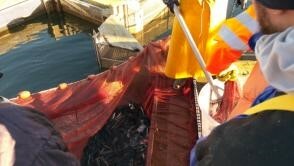 The City Council started to ask that the fishermen remove their tools, a requirement that the fishermen did not understand clearly and that led to the initiation of a series of negotiations between the council and the fishermen. The lagoon was registered as public property in 1902, and from this time Grosseto Province began to maintain the canals and clean the vegetation on the shores. In 1910, ownership rights of the northern dunes were revoked and a reforestation plan was started that led to the replanting of trees on 460 hectares. Bigger problems arrived when the administrative machine redistributed responsibilities and stopped the necessary maintenance of the shores and canals. In the 1950s, for about ten years, nothing was done and the health of the ecosystem started to degenerate. Overfishing further contributed to the deteriorating situation. The City Council was unable to manage the lagoon properly, and as a result exchange of water with the sea was reduced and fish in the lagoon were scarcer. Consequently, fishermen’s revenues started to decline due to lack of fish (Damiani 2013, p. 78). This led to a public discussion between all stakeholders: Orbetello residents, the district magistrate, the City Council administration, the fishermen, the union and the local political parties. Local newspapers started to publish enquires, almost daily for over two years. Clearly, a new approach was needed. Finally, the solution that was found and that would persist for the next 30 years was to create a cooperative (as described in 1.6 above). A clear redistribution of responsibilities was necessary. The system that was developed persists today and has the fishing tools, boats, fixed installations and buildings maintained by the fishermen, who pay rent, while the local administration is responsible for the maintenance of the shores and canals. After nearly all the fish died in 1991-1992, the lagoon was declared to be of public nature and was therefore able to receive state funds as well as European funds. All the heavy maintenance was taken care of by the state between 1992 to 2011, with special permission to act proactively. From 2012, approval by regional authorities was introduced and the system is not working as smoothly due to the added level of bureaucracy. Furthermore, according to the fishermen, the maintenance of the pumps and the harvesting of algae is not done in a consistent manner by the state. According to the fishermen, some remaining critical points for the ecosystem are as follows. Likewise, factors that are specifically hindering the abundance of fish are as follows. Fish stocks in the Mediterranean have been declining for decades. According to the scientific advice (CFP 2017), in the Mediterranean, the large majority of fish stocks assessed are shrinking and some are on the verge of depletion: despite recent efforts the situation is not improving. Managing fish stocks is complicated by the fact that many of them are shared with non-EU countries. The European eel, Anguilla anguilla L. 1758, is recognised today as an international marine species and a shared resource among European and Mediterranean countries. For this species, major problems exist in relation to a continent-wide decline in recruitment observed in the course of the last decades, and to a contraction in adult eel capture fisheries. The particularity of the situation is that eel is fished locally in lagoons and rivers but has to be managed internationally. So far, the only local response is to buy young fish when available and repopulate the area. Traditional fishing techniques employing the lavoriero, martavello and the tramaglio are still used to catch a variety of fish (Figure 3). Sea bass, sea bream, grey mullet, eels, small clams called calcinelli, mazzancolle (a type of shrimp) and a small kind of crab called femminelle are the most commonly caught species of fish. The lavoriero is a barrier once made from wood and now mechanized. It is positioned in the channels that allow the exchange of water between the lagoon and the open seas. This system takes advantage of the high tide: as water enters the lagoon from the sea, it attracts shoals of fish towards the barrier and funnels them into a series of “deceptive chambers” that lead them to the “capture chamber”. Here the fish, still alive and in the water, are selected by size and either hoisted up with nets or released. Today fish are stored in mobile cages in the lagoon waiting to be sold if demand is low. In some seasons, not only the high tide but also the reproductive instincts of the fish push them towards the lagoon’s outlet. Sexually mature fish are allowed to pass so that they reach the coastal waters where they can reproduce. From here, the younger fish, thanks to the low tide, can re-enter the lagoon. The lavoriero is used to catch all of the lagoon’s fish species, as is the tramaglio, a bottom-set net formed by three layers of netting, used primarily in the summer and in November, December and January. In the lagoon, the martavello and the traps are even more selective, as they only catch eels, femminelle (winter crabs), mazzancolle shrimp and blennies. During the winter, the martavello, a funnel-shaped net with a final chamber, is fixed inside “deceptive structures” made from nets, canes and poles. In the summer, it is fixed inside mobile and less complicated structures known as crocioni that can be moved daily (as registered in Slow Food Presidium rules). As it is impossible for local communities to solve international fishing problems, of which they are the victims, they can only concentrate on local sustainable practices. This section will describe some of the practices adopted in Orbetello. Fishing in Orbetello is carried out during the right seasons so as to allow for reproduction, and small-sized fish are freed. In the lagoon, this is easier than in the open sea. This is due to the fact that fixed installations let some small-sized fish pass, but if small fish are caught, they are released back into the sea (Figure 4). Also, market demand is particularly defined by size and timing. In the past, large amounts of fish were caught at times when there was no demand from clients, creating the conditions for a price drop or product waste. Furthermore, different clients want different products—supermarkets prefer smaller sizes, while restaurant distributors prefer bigger ones. The cooperative has built a system to meet these different demands. When fish are caught during the right season, operators are able to send them to several mobile cages suspended in the lagoon. There they are stored for a few days to a few months, then selected live to satisfy the demand of different markets (Figure 5). Fish are not fed while in the cages, but there is ample space to move around and feed naturally, although not as much as if they were free. With this cage management, waste is minimal compared to open sea fishing and revenues are maximized. The sustainability of this system is such that even if fish are scarcer today, stocks are not depleted and revenues are maintained. This is possible thanks to the precise selection of only what is in demand, therefore reducing waste to zero. Fishermen have said that open sea fishing practices are no longer sustainable. For example, bycatch or bottom trawling ruins the ecosystem and creates a lot of waste that could be easily avoided. Global markets have reduced fish prices and many countries do not respect good fishing practices. Traditionally, the cooperative has been restricted only to fishing activities, however fish processing has a historic tradition. Besides classic smoking and marinating techniques, two unusual techniques are a legacy of the Spanish rule of the 16th and 17th centuries. They are sfumatura, whereby the fish is seasoned with a sweet pepper-based sauce, and scavecciatura, which is a kind of escabeche that uses a hot marinade of vinegar, rosemary, garlic and peppers. Different kinds of fish are used depending on the season, and local festivities follow the rhythm of the catches and life in the lagoon. The cooperative has opened a transformation site where they are able to prepare products to be sold locally or to prepare for distribution. Products sold include traditional marinated fish, dried fish eggs and canned fish sauce, used for pasta. The fishermen also manage a restaurant where one can enjoy their fish locally (Figure 6). This has become a very lucrative activity and the number of people employed is now above 100. The fishermen are also involved in many social activities in town. The barchini race in the water of the lagoon has been running since 1768. Food festivals mix products from the lagoon with those of the land. Last but not least, this unique system has been made a Presidium by Slow Food. Slow Food is a non-profit organisation that protects the environment and sponsors clean food. Slow Food Presidia sustains quality production methods at risk of extinction by protecting unique regions and ecosystems, recovering traditional processing methods and safeguarding native breeds and local plant varieties (see Slow Food International). 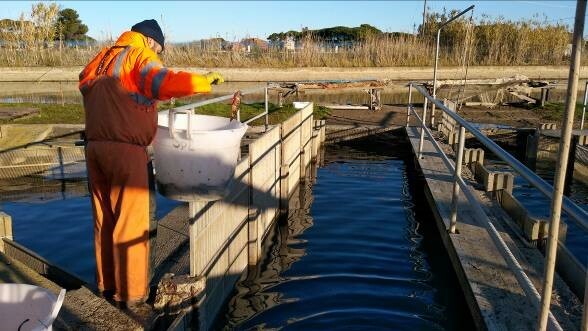 The Orbetello Presidium was established in an effort to reverse the current trends and maintains the objective of ensuring that the fishermen, involved for the first time in managing the lagoon, work to improve the lagoon’s environmental situation. They must make requests for and monitor the interventions necessary to restore and maintain its health. The Presidium applies political pressure as it can publicly talk to the media and the general public about fishing in the lagoon. All the work of maintaining sustainable fishing and preserving the ecosystem still rests in the hands of the cooperative and the local government. For example, the cooperative is responsible for the fish population and respecting the sustainability of their practices, while the local government does the exceptional work such as oxygenating the lagoon (done in 2017 to try to stop asphyxiation of fish due to record temperatures) and works on the lagoon’s edges. The Presidium protects historical fishing and fish processing traditions, focusing on the protection of traditional techniques and wild species: sea bass, grey mullet, eels, calcinelli (small fish), mazzancolle (shrimp) and femminelle (crabs). Protection involves specifically the Bottarga di Orbetello, or dried fish roe. The Presidium rules cover every aspect of production from fishing to sale. The traditional fishing methods in the lagoon have also became a Slow Food Presidium, so all products issued by the fishing techniques described in section 3.3 above receive the Slow Food label. The Slow Food label also helps to market the products efficiently and offers unique visibility in the consumer market. As Slow Food Presidia are appreciated by consumers, their products sell at a higher average selling price. Communities of fishermen (Figure 8) have been living off the lagoon for more than 2,000 years. However, depending on how the water was managed, they have benefitted in very different ways, sometimes barely surviving and other times thriving. Most of the problems that have affected the lagoon throughout its long history have been man-made: deforestation, modification to the environment, overfishing, pollution and lately, global warming and destructive fishing practices. Exclusive fishing rights to one small party have also created great inequality among fishermen in the past. If community members wish to maintain their livelihoods, they need to be proactive toward change and continue to find new solutions. In the past, maintaining the canals and releasing small or sexually mature fish was enough. Prices had always been controlled, but the fish economy was only local for a long time. Now with a global economy, high average selling prices are more difficult to achieve. Selling fish at an acceptable price level has been an important area of focus and was partially addressed by building temporary holding cages. Yet today more actions have to be taken. Low fish prices due to globalization and increasing temperatures impose changes in traditional fishing systems as livelihoods are no longer maintained. If temperatures keep increasing, fish in the lagoon might simply die. 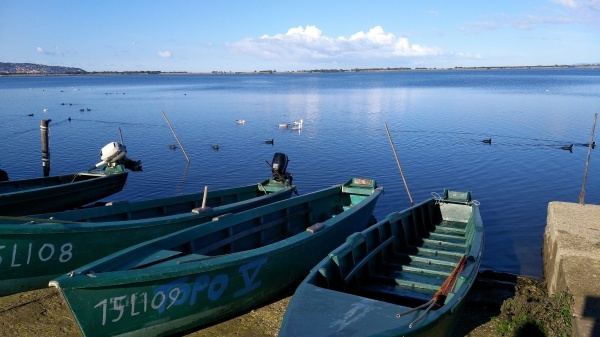 Additional environmental problems in the Orbetello lagoon have an international dimension in that its fishery is affected directly by activities in the Mediterranean Sea and the European Union policy on fisheries. Likewise, a history of external interference in the management of fisheries and recently globalization, have left little or no space for traditional management practices and preservation of the lagoon and related livelihoods, although traditional fishing practices are still in use. In particular, globalization has altered the balance of goods and services produced by the lagoon and redistributed the economic benefits flowing from them, adversely affecting the livelihoods of the local fishing community. The fishermen introduced a new system of stock management and created alternative revenues, such as transformation of fish and new hospitality activities, to increase lowering margins. Increasing water temperatures demand daily monitoring and adjustments using sea water to diminish temperature, oxygen injections or pumping of asphyxiated water out. Fish stocks have to be maintained artificially by buying young fish as not enough are coming in on their own from the sea anymore. For fishermen, maintaining their livelihoods will be an expensive task: just fishing is not enough and revenues must be maintained by diversifying fishermen’s activities (for example adding hospitality) while keeping the core business healthy. Consorzio Lamma 2015, Caldo anomalo e anossia: moria di pesci nella laguna di Orbetello, with graphs on water temperatures, viewed 15 January 2017, <http://www.lamma.rete.toscana.it>. Ciccotti, E 2007, ‘Il caso dell’Anguilla europea, tra gestione e conservazione’, Biologia Ambientale, vol. 21, no. 2, pp. 57-66. Damiani, G 2013, Laguna di Orbetello, Edizioni Effigi, Grosseto. European Commission, Common Fisheries Policies, viewed 12 January 2017, <https://ec.europa.eu/fisheries/cfp_en>. Pantaloni M 2014, La laguna di Orbetello (GR), viewed 12 January 2017, <http://www.geoitaliani.it/2014/08/laguna-di-orbetello.html>. Slow Food International, Slow Food Presidio di Orbetello, viewed 12 January 2017, <http://www.fondazioneslowfood.com/en/slow-food-presidia/>. Statuti della Comunità di Orbetello del 1414, con aggiunte posteriori dal 1557 al 1797, 1797, Archivio Storico del comune di Orbetello.